Pinning allows for easy, safe storage of both Knight and Horse without taking out large chunks from customizable foam-block movement trays. 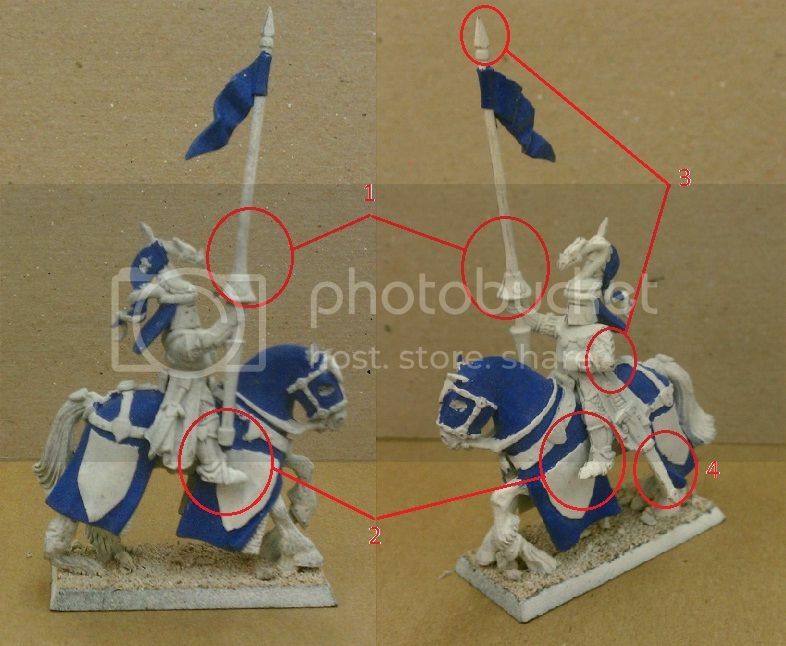 A pinned Knight has a holding point that allows for easier painting and retouching. A pinned Lord model can be switched between different mounts, so that the same knightly model can be used for different lists. The following article will give you steps, knowhow, and the why-it-can-be-a-good-thing. I apologize beforehand if the pictures are fuzzy, I do not have a dedicating miniature camera. The following is a list of the tools and materials you'll need for this tutorial. For reference, I have taken an image of an older model of mine and pointed out some of the issues with just gluing the knight to the horse. One of the biggest issues is priming the miniature. It takes careful handling to fully prime a glued knight, leading to missed spots under the horse and legs, and under portions of armor. 1- Here you can see where poor storage has started to damage the lance, bending the plastic. 2- As can be seen, on both sides the legs rest in front of the front shields on the barding. Unless painted seperately or very, very carefully, painting either armor or heraldry will cause issues. The placing of the lance on the right side is also an issue, as it blocks part of the barding and straps. 3- Another problem is wear on the paint job. Even though this model doesn't have a shield, it would be having the same issues with wear and paint damage, even possibly end up breaking off depending on the attachment strength. 4- The scabbard, more extraneous plastic, has started to bend. The best way to prepare the knights is to start with unassembled models. Knights that already assembled can still be pinned, but you have to be careful because of how the mini is probably glued together, as the drilling can push apart the legs.